Strange creatures have invaded Fairyland, including the dreaded Elephly, and are causing a stir among the land's inhabitants. Only the Good Fairy has the power to defeat them, but she needs help in preparing her magical potions. It will take some practice on your part however, because it's not as easy as it seems and will require excellent solving skills. 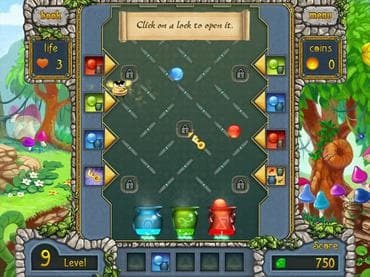 Assist the Good Fairy in fighting off the creatures by making potions in 35 fantastic levels. Simply switch paths to get the right ingredients to the correct vials, but watch out for bee attacks, locks, and ice avalanches. Collect coins to win extra lives, use certain types of potions as power-ups, and win rewarding trophies. The better you do, the more successful the Good Fairy will be when it comes time to battle the creatures. Download this free full version game today and help the citizens of Fairyland! If you have questions about Rolling Spells game, please contact us using this form.